High Quality Material:100% solid brass can be effective corrosion protection. Ensure Your Safety:Our propane regulator with hose has excess flow protection for your safety and will automatically shut off. Convenient Installation: Installs quickly and easily tool-less attachment to propane tanks and cylinders. Apply to: Gas grills ,heaters, lanterns, camp stoves, tabletop grills, fire pit table and more. Great for: BBQ, camping, tailgating, heating needs or having an outdoor cookout. For your safety, please read before using the hose. 1.FULLY TIGHTENED at both propane tank side and grill side before using on your propane appliances. 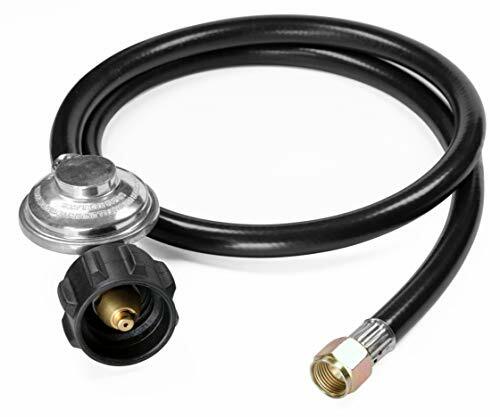 2.Check and make sure the hose is away from the OPEN FIRE before installing it to your appliances. 3.Keep the hose away from HIGH TEMPERATURE. Replacement for Weber Genesis 300-series gas grills, Genesis Silver C, Genesis Gold ,Genesis Platinum , Spirit E-210/E-310 etc. and most of Char-broil gas grill with side burner,Dyna-Glo dgp350snp-d,mfa350bnp/mfa350cnp ge530bsp-d, dge486ssp-d, dge486gsp-d etc.,Uniflame GBC873W-C, GBC873W, GBC940WIR, GBC940WIR-C, GBC976W, GBC956W1-C, GBC1076WE-C, BH12-101-001-02 etc., most of Kenmore gas grill and most of Brinkmann gas grill. Easy installation - No tools required, tool-less attachment to tank. It is normal if you hear noise in the regulator, it is the resonance of the gas in the regulator.